the white house goes shamrock green! | six words to change the world. ← perfection: jason segel plus paul rudd. the white house goes shamrock green! Happy St. Patrick’s Day, everyone! I’d say something cool and witty in Gaelic, but guess what, I’m too lazy to look it up! 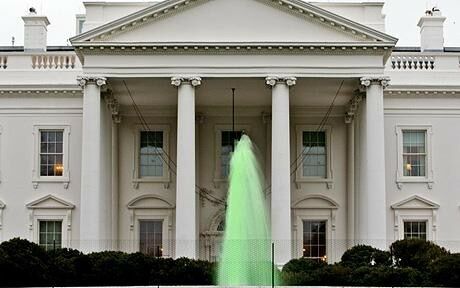 Anyway, St. Patrick’s Day is being celebrated at the White House this year Obama style. Meeeesh had them dye all the fountain water green! Love her. And now, perhaps for the first time ever, a SWTCTW repost. Dearest Madeline found this gem and posted it awhile back, but I think today’s as great a day as any to show it again. I present to you the song “There’s No One As Irish As Barack Obama”! It’s no “Danny Boy”, but I think I love it. Have a fantastic St. Patrick’s Day! Do something Irishy! Drink something Guinnessy! Get lucky…in the Irish sort of way.